Spice up the traditional Reese's Peanut Butter cup cookies with just a dash of cinnamon. A traditional Mexican twist on one of our traditional Christmas favorites. Dough chills for an hour, then preheat oven to 350. Beat butter and brown sugar until light and fluffy. Add vanilla and cinnamon. 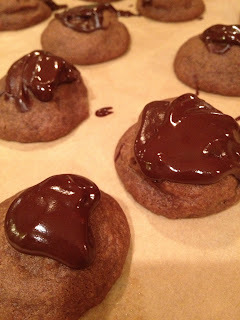 Stir flour and melted unsweetened chocolate into batter. Chill for 1 hour. Shape dough around (unwrapped!) peanut butter cup. Bake about 20 min. Cool, then top each cookie with melted chocolate.